Early reports from trusted sources highlighted a catalogue of errors, from wait times of 1 hour plus, to problems ordering from the iPads, and poorly presented burgers falling apart as they arrived. Thankfully all these problems seem to have been ironed out during my visit. 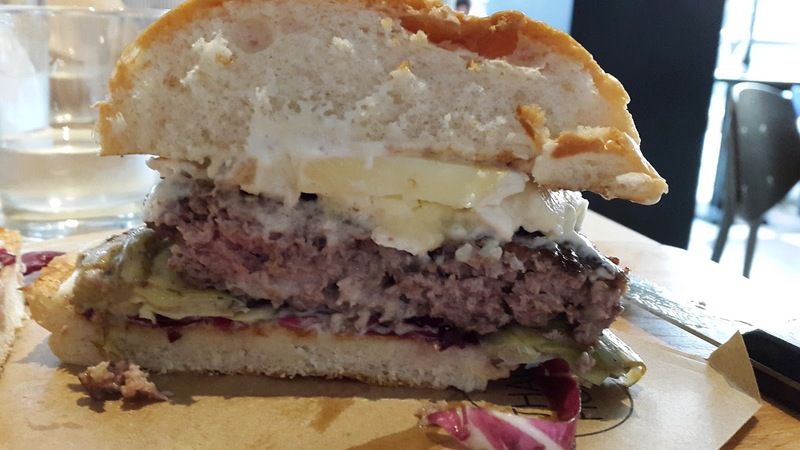 The Passionburger is topped with brie, artichoke, radicchio, and green peppercorn mayo - which is one of the stranger combinations I've tried. The ingredients are all authentically, and I'm reasurred, painstakingly sourced and imported from Italy, and I expect the passion in the name of this burger relates to famed aphrodisiac properties of this vegetable. It was a revelation to discover that the combination not only works, but delivers a brilliant, delicate and balanced burger. The green peppercorn mayo has a mellow peppery flavour that melds with the soft brie (which would have been better melted) beautifully. Underneath the patty, the salty and slightly sweet artichoke is countered by the sharp bitterness of the radicchio and it's all brought together by the Italian beef and lighter than usual demi-brioche bun. The beef in the Passionburger (and indeed in all the beef-based burgers at Ham Holy Burger) is really quite special, and technically it shouldn't be nearly as good as it is. It comes from La Granda cattle, raised in Piedemont on the foothills of the Alps - and it's a breed of cattle that has very little fat coursing through the meat. So on paper, this beef shouldn't maketh a good burger. But it does. Oh god it does. It remains pretty juicy and packs HUGE flavour - an intensely beefy hit greets you up front on the palate and then softens gently into a mellow, earthy, and long aftertaste. This really is excellent beef. 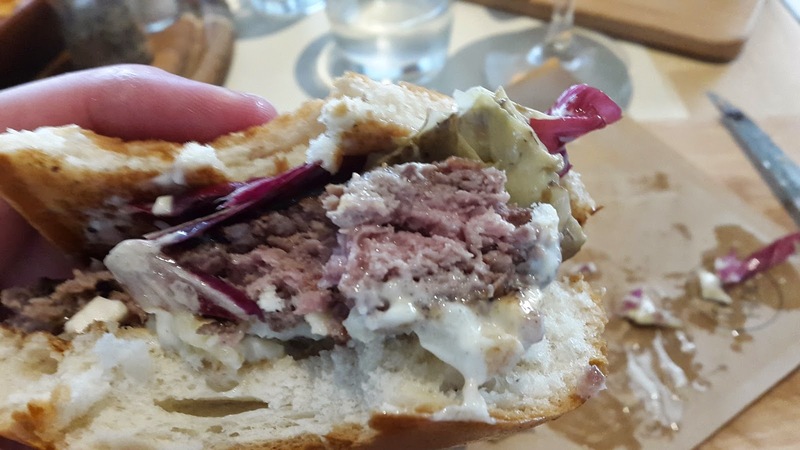 The burgers are cooked medium as standard, although in Italy even this level of light cooking is frowned upon and they're usually well done - which is only a slight niggle, as apart from this the patty is a seriously good piece of meat. Ham Holy Burger's bun uses the tried and tested Miller's brioche bun, so you know you're in safe hands. There is an even toasting across the inside of each bun which is delivered by means of a conveyor toaster, and the inside is super light and airy. Fondue fries and wedges are both well worth accessorising your burger with, even if the latter are almost five quid. The Fondue fries are effectively french fries smothered with a parmesan laden bechamel sauce, which is seriously moreish. The wedges are cut a little more thinly than you'd expect a normal wedge to be, which makes them nice and crispy - they clearly benefit from their double cooking. 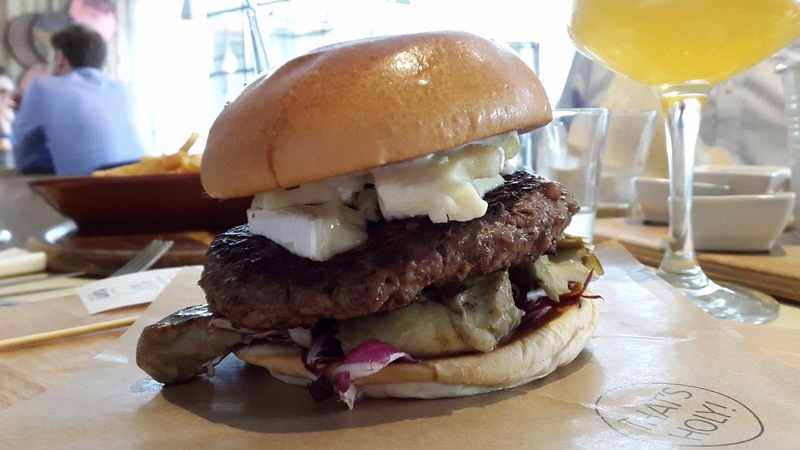 This burger had the potential to fall down in a number of areas - lean beef, unmelted cheese, and decidedly un-burgery ingredients (read 'artichoke') - but what you end up with is a burger that is far greater than the sum of its parts. 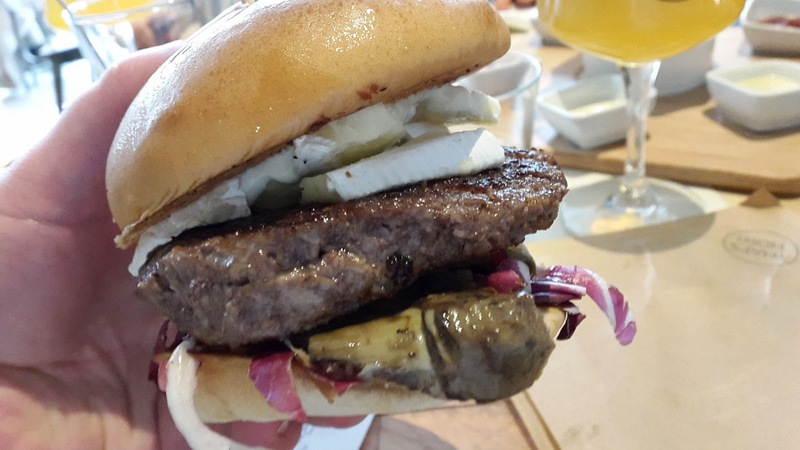 It brings together a quality set of prime, Italian ingredients in harmony - with each element blending together to create a very enjoyable burger. It's a very different burger to many of the ones available around London currently - it's not messy, or laden with sauce, or smothered in melted American cheese - in fact it draws parallels in many ways with the burger at Big Fernand, the recently opened French Burger joint in Fitzrovia, near Tottenham Court Road. It's an incredibly Italian take on the American classic, and I know that the British execution is far better than it's cousins in it's Italian homeland, where Ham Holy Burger first launched (it's part of the Neopolitan pizza restaurant group Rossopomodoro). Colour me surprised because I was expecting this to be the usual central London department store bunch of 'meh'. 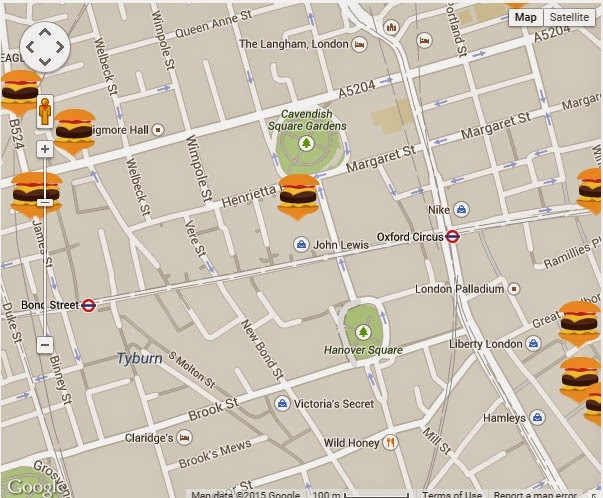 Now if only these burgers were also never knowingly undersold.